Being in the event industry has its perks. We work hard and play hard. Nothing can stop us from having a great time but we also know how to get down to business. Just when we thought we’ve seen it all something new comes onto our plate. We welcome new challenges and thrive off of learning new tricks. Give us a whirl! We’re aren’t out to get you – we’re simply here to make the even rental process a lot less complicated. You ask, we supply…and then we do a little more. This is just another way we bring more to the table. Today, All Occasions is a full-service event rental company, providing an extensive range of rental items and equipment in Pennsylvania, Ohio, West Virginia, Maryland, and New York. With Showrooms located in Pittsburgh, Pennsylvania, Eighty Four, Pennsylvania and Cleveland, Ohio, All Occasions provides customers with superior service and an unmatched product selection. 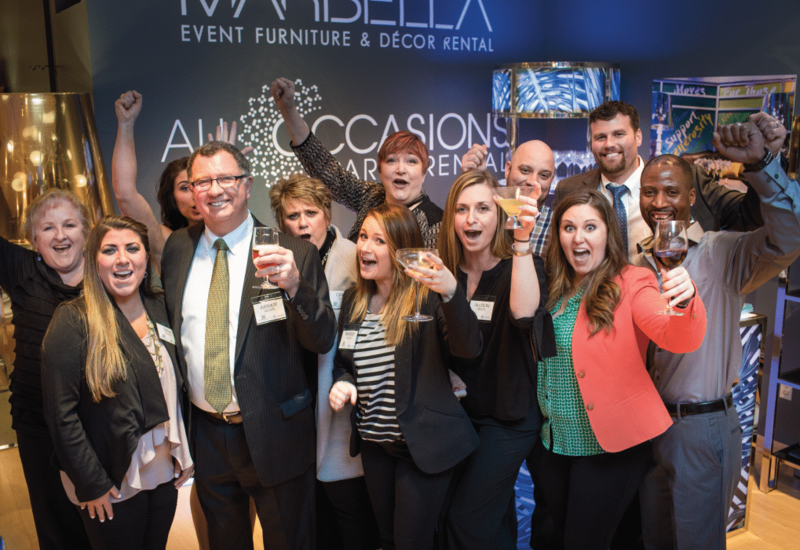 All Occasions has developed a network of partners to help bring distinctive new products to the market, including Marbella Event Furniture and Decor Rental for event furniture rental, Chameleon Chairs for stylish new seating options, and Rental Resource Partners for a broader selection of high-end dinnerware, flatware, and glassware. Read more about All Occasions Party Rental’s partners.